Georgia’s heritage is increasingly at risk from both natural and man-made critical incidents. For instance, our coast is resource-rich, both in terms of natural and cultural resources. Last Fall, we dodged a bullet with Hurricane Matthew. 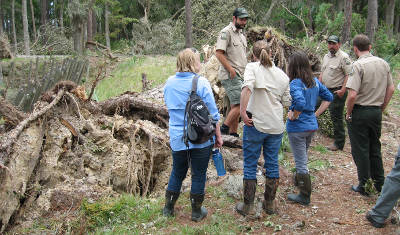 If the storm had tracked another five miles to the west, the Historic Preservation Division's damage assessment team would have found far different effects than we did at historic sites like Fort McAllister and Hofwyl Broadfield Plantation. In the wake of that incident, Georgia Department of Natural Resources Commissioner Mark Williams initiated an after-action review. That review has yielded a series of steps we are taking to improve our response to such occurrences. HPD is working on an overarching response plan that will analyze threat types and offer guidance on initial recovery steps for historic sites. This will be linked to DNR’s All-Hazards Response Plan, which is essentially our strategic framework for incident response. We’re also working on a plan to put an HPD staffer in the Georgia Emergency Operations Center (EOC), so that we are up-to-date on conditions on the ground as the blue lights quit flashing and the recovery teams start rolling in the aftermath of an incident. Several weeks ago, I attended a “train the trainers” workshop on critical incident response, so that DNR can start to fold some folks from all the DNR divisions into the Incident Command Post (ICP) general staff. I’ll be part of a group of teams instructing DNR personnel around the state on the Incident Command System (ICS) and National Response Framework. At HPD, we’ll be doing a lot of thinking about this issue over the next few years, and I’ll be offering some further thoughts on roles for non-governmental entities as we start to identify incident response needs for historic preservation. The Society for Georgia Archaeology (SGA) held its Spring Meeting in May. May is Georgia Archaeology Month, and the 2017 theme is "Raised from the Depths: The Archaeology of the Civil War in Georgia." Deepening the Savannah River channel from 42 to 47 feet is the main objective of the Savannah Harbor Expansion Project (SHEP), accommodating large container ships like the COSCO Development to port in Georgia. Before work on the project began, numerous environmental and cultural resource studies were conducted to assess the impacts of project activities to the surrounding landscape. As a result, it was determined that channel dredging would negatively impact the 1987 National Register of Historic Places-listed CSS Georgia, a sunken ironclad gunboat located on the edge of the main navigational channel just north of Old Fort Jackson. Efforts to fully document and to plan the recovery of the CSS Georgia ramped-up in 2003 (there were previous salvage operations in the 1960s and 1980s) with the final recovery phase of the heavy west casemate set to begin in June 2017, and last until the beginning of August 2017. Intentionally scuttled by the Confederates in 1864 as Sherman advanced on Savannah, the CSS Georgia sat untouched in the muddy waters of the Savannah River until the United States Army Corps of Engineers (USACE)-managed mitigation project began lifting segments out of the river in 2015. The COSCO Development leaving the Port of Savannah on the evening of May 12th. Onlookers from Morrell Park held with the Savannah tradition by waving to the crew aboard the vessel, a gesture that would delight Florence Martus. May's SGA meeting began with a talk by USACE lead archaeologist Julie Morgan, who outlined the recovery efforts and next phases of the recovery project. Marked by red buoy 52A, the wreck site of the CSS Georgia has, to-date, yielded nearly 30,000 artifacts, including six cannons and 200 pieces of unexploded ordinance (since made inert). However, the more important aspects of the recovery lie in information revealed about the ship's appearance and the construction methods used to build it, by the tons of fragmented casemate (or armor) and other structural remains of the vessel, since no existing blueprints have been found. Commissioned in 1862 by the Ladies Gunboat Society, the Georgia was designed by a citizens' committee led by foundry owner Alvin N. Miller, and constructed in Savannah at Hardee’s Shipyard. Civil War-era lithographs show differences in her design, particularly in the style of her casemate and the number and positioning of gun ports, according to Julie Morgan. Additional research questions have been outlined and will be addressed in a final technical report. Educational outreach opportunities for the public have been presented through festivals, lectures, and lesson plans. The image above was achieved by using side scan sonar during the 2003 underwater archaeological survey (Watts and James, Jr./Panamerican Consultants 2007: 34). Notice the dredge scars at the left. The remains of the Georgia were rediscovered in 1968 when a dredge operating in the vicinity of the wreck site encountered structural remains during a navigation channel-widening project. Following the informative talk, the group made its way to the Clusky Embankment Stores located within the retaining wall near Factors Walk, adjacent to City Hall and along the Drayton Street ramp. Blake Ayala (Georgia Southern University alumnus) discussed his thesis work at the site, which involved archival research and limited test excavations within the vaults in order to determine their function. It turns out, the vaults were used for a variety of purposes, and more excavation work can help reveal specific activity areas. What we do know is that they were used for storage, a coopering business, and even as a campsite for Union troops. However, one of the more interesting uses revealed by the archival research is that the vaults served as office space in the 1851 U.S. Coast Guard survey and mapping of the Savannah harbor. Check out the interpretive panels at the Clusky Embankment the next time you are walking along River Street. The soggy afternoon was spent touring Old Fort Jackson and Fort Pulaski. Fort Jackson is the oldest standing brick fortification in Georgia and is a National Historic Landmark. Originally commissioned by President Jefferson to serve within a national defense system of fortifications, Fort James Jackson was manned during the War of 1812 and the Civil War. Since the 1980s, Old Fort Jackson has exhibited two cannons recovered from the CSS Georgia wreck site, as well as smaller artifacts. This historic site will offer fantastic views of next month’s operation to recover the final pieces of casemate. Fort Pulaski is located on Cockspur Island and is a National Monument. Constructed from readily available Savannah Grey bricks and other masonry imports, Fort Pulaski’s strength was tested by newly developed Union technology: the rifled cannon. The walls of the “indestructible fort” were breached in less than thirty hours, as is evident by the numerous pock marks on the exterior walls. 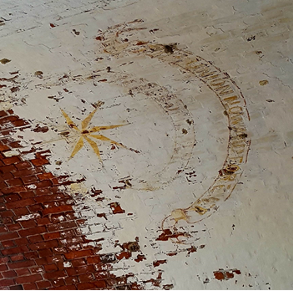 Once occupied, Union troops left their mark on the fort in more than one way. If you are looking for more opportunities to see archaeology in action, especially as it relates to the Civil War, Georgia Southern University will be offering Public Days on June 3rd and 10th at Camp Lawton, in Magnolia Springs State Park. You too can help save Georgia’s past by joining the Society for Georgia Archaeology. 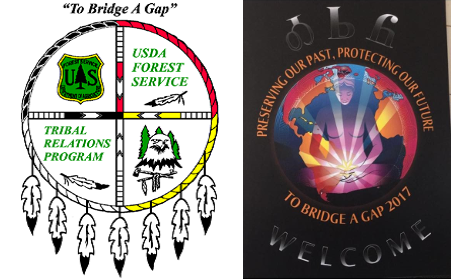 In February, the Cherokee Nation and the USDA Forest Service co-sponsored the 16th annual “To Bridge A Gap” conference in Tulsa, Oklahoma. The annual conference helps strengthen government-to-government relationships between the U.S. Forest Service and federally recognized tribal governments on a variety of cultural and natural resource management issues. The meetings originally began as a way for the regional National Forest representatives to conduct face-to-face consultation with federally recognized Tribal Nations concerning the management of significant cultural and natural resources located on USDA Forest Service lands. Because these lands are federal property, the USDA must consult with the tribal nations under the National Historic Preservation Act, in addition to several other federal laws. Over the last several years, the conference has grown to include other federal and state agencies, as well as academic institutions. The conference is highly collaborative and integrates traditional ecological knowledge and scientific research, which helps both agencies and tribes to become more environmentally sustainable. This year, more than 350 people attended the conference, representing 41 Tribal Nations, 35 Federal and State Governments, five academic institutions, and 25 environmental/archaeological firms. Presentations focused on topics including climate change and cultural heritage, tribal perspectives on Traditional Cultural Places, current research along the Trail of Tears, and heirloom plants and river cane projects. In addition, tribal panels focused on the topics of Tribal water rights and the successful navigation of federal laws, such as the Native American Graves Protection and Repatriation Act (NAGPRA) and Archaeological Resources Protection Act (ARPA). The Georgia Genealogical Society will host its 2nd Annual Summer Genealogy Picnic in Morrow, Ga. on Saturday, June 10th. Caroline Crowell and Allison Hudgins, both Reference Archivists from the Georgia Archives, will focus on the archive's new online catalog and research tips using the manuscript collections; and Joanne Smalley, a GGS member, will give a presentation from the perspective of a researcher. The event is free and open to the public. A traditional summer sandwich lunch will be available for a donation. Information here. TITLE IMAGE: The New Hebron Baptist Church, in Concord, was listed in the National Register of Historic Places in May.